One of the best things I love about Chicago is experiencing live music right in the heart of the city. And this summer the City of Chicago has put together a great group of artists performing for this year’s edition of Downtown Sound. 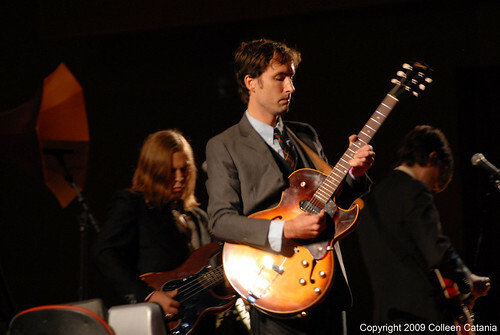 Looking back, I have some great memories, one of which is seeing Andrew Bird evoke a frenzy of kids to rush the stage at the Pritzker Pavilion where the Downtown Sound concerts are held. And looking at the 2010 list there’s a little bit of everything offering up an excellent mix of indie-rock, hip hop, pop, gospel and other great tunes from local and national bands for fans to rock and jam out to. That said, fans should definitely enjoy the shows as a perfect chance to leave work behind and escape in to the live music of Besnard Lakes, M. Ward, Kid Sister, Nels Cline (of Wilco) and others. Kudos to the City of Chicago for putting on these shows for free. All shows start at 6:30pm. May 31: Hum with Volcano! What are some of your favorite Downtown Sound moments? For those of you not in Chicago how does your city support live music? summer concerts in Denver are outdoor events so people can have a picnic and relax while listening to great music. It's truly a must see and I won't miss it this year.